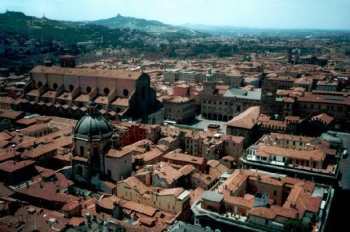 Bologna Italy tourist attractions and information. Bologna Italy is the regional capital of Emilia Romagna, a prosperous north Italian city and point of passage between the north and south of the Peninsula. It is home of the oldest Europe's University, which dates from the 11th century, it is really popular for the cuisine (la cucina Bolognese). It is a city much loved for its architecture, the extensive town center is characterized by miles upon miles of attractive covered walkways known as "portici" (porticoes, porches), some of the best-preserved in Europe. Piazza Maggiore is the monumental center of the city whose design was originated in the XIII century and later went under further processing. In the square there are the main monuments as the Church of San Petronio and the palace of the Podesta'. Church of San Petronio is a Cathedral, famous example of Italian Gothic style, was begun in 1390 and completed in 1659. The central portal is decorated with sculptures of artist Jacopo della Quercia from Siena and on the inside you can admire his sculptures. Fountain of Neptune, also known as Giant fountain is considered among one of the most beautiful fountains of the sixteenth century. Above the base there are statues by Giambologna and specifically of Neptune with his trident in the action to appease the waves, some cherubs with dolphins and four mermaids at the bottom. Leaning towers are undoubtedly the most famous and characteristic monument of Bologna Italy. In medieval times there were many noble towers but today there are just the Asinelli tower (97.6 m) of the first decades of the XII century and the tower Garisenda (48.16 meters). Church of St. Francis, with a large churchyard, the church was built by the Franciscans between 1236 and 1263, was later restored in 800 and rebuilt after the war. On his left side stands the chapel of San Bernardino in late Gothic style, and outside stands two towers, one of the 1260, the other of 1400. In the Monastery there is the Cloister of the Dead, from the XIV Century, where you will find the monumental tombs of University Rectors. The Complex of Santo Stefano is a compact group of ancient sacred buildings dedicated to the martyr Stephen, probably built on the site of the Roman Temple of Isis. The complex is also called of the seven Churches with the Church of the Crucifix, the Church of St. Sepulchre and St. Vitale and Agricola. Behind the courtyard of Pilate, is the Church of Our Lady of Loreto, the Trinity and the three Chapels of St. Juliana, St. Jerome and of Consolation. From the Courtyard you will reach the beautiful Cloister of the Benedictines.